If you don’t like sporting the pasty white look all through winter, you might check out this facial tanner. Although it is entirely possible to cross the line and give yourself an excessively tan face and still have a pale body, there are ways to make this look a lot more natural. Like you could turn it on just long enough to give yourself a little bit of color in your cheeks. This lamp also claims to be safer than the usual tanning beds. However, I’m sure it does have still at least slight risks. Luckily, it does have a timer to help try to prevent you walking around with an Oompa Loompa face. The solarium works faster than sitting in the sun, and you can sit in front of it for up to 30 minutes at a time. 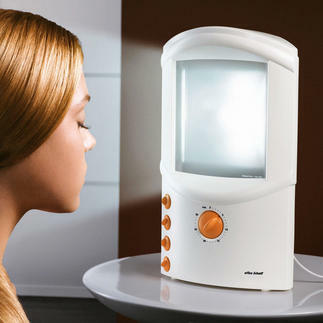 It features a 400W halogen lamp and has a special filter only tanning UVA will reach your skin. The facial tanner comes with two sets of protective eye shades and a 3-year Pro-Idee guarantee. It’s portable with a handle on the top and only weighs about 12lbs. You can pick it up for £ 175 or about $274. On 11th december I recieved confirmation from Pro-Idee that my multiple order was recieved and would be with me in 8 – 10 days . 28 days later it has not arrived and they have not responded to either of my e-mails . SERIOUSLY NOT IMPRESSED with this company.